* Nicholas Brocke - head, white, male, born Jany 1855, age 45, married, for 22 years, born in Michifan, father and mother born in Germany, a farmer, can read, write, and speak English, owns farm with a mortgage. 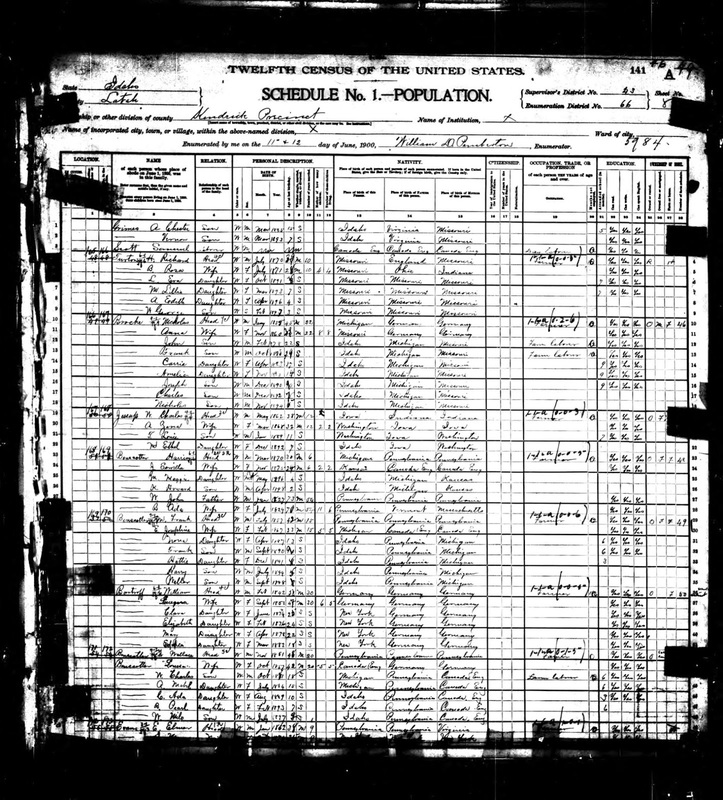 1900 United States Federal Census, Latah County, Idaho, population schedule, Kendrick Precinct, Enumeration District 66, Page 8A (stamped), Dwelling # 166, Family #167, Nicholas Brocke household, indexed database with digital images, Ancestry.com (http://www.ancestry.com), citing National Archives Microfilm Publication T623, Roll 233. By the time of the 1900 U.S. Census, Nicholas and Anna (Grieser) Brocke had had eight children. Seven of them are listed on this record. The one missing is Etta Susan Brocke, born in 1881 in Oregon. I don't know what happened to her - I don't have a death record or a marriage record for her. Several of the year-month and ages are wrong (based on other more authoritative records) - for instance, Anna (Grieser) Brocke was born in November 1859, not November 1860; Frank Brocke was born in October 1879, not October 1880; Amelia Brocke was born in November 1884, not November 1885; Joseph Brocke was born in September 1889, not December 1890; Charles Brocke was born in November 1892, not December 1892.